Who's ready for the holidays?! I teamed up with Voodoo Vixen on today's post with this fun flirty vintage skirt. I instantly fell in love with this skirt because I love full midi skirts, making it a perfect outfit option for the holidays. Voodoo Vixen is a vintage inspired label based in the UK. I love the vintage feel they put in their styles and designs. Sometimes I feel like I was born in the wrong era because that pin up vintage style is one of my favorites. Do you remember the pin up girl Halloween costume I recreated last year? I paired the skirt with a plain gray top which is actually a dress that no longer fits me as a dress. LOL. 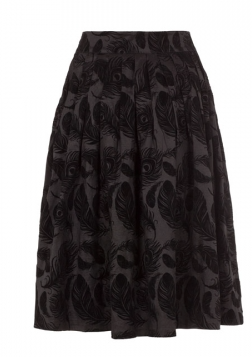 The skirt has a velvet flock print on it, giving the pleated skirt some extra detail. I added some festive accessories to make this look holiday ready. I wore my metallic heels which I love to bring out this time of year, a statement necklace and a red clutch for a little pop of color. Voodoo Vixen has given my readers a 20% off coupon code at check out (patty20)! So if your still don't know what to wear for the holidays and want a vintage look definitely check them out.